Visitors to Mission Hill Winery in West Kelowna pass under a massive archway that frames the courtyard and buildings beyond. Suspended at the apex of the archway is a 5,000-kilogram limestone cube, etched with the winery founder’s coat of arms. It’s an impressive welcome to the award-winning hilltop winery, a mainstay of wine production in British Columbia’s Okanagan Valley for 35 years. It’s also an indication that the winery’s attention to detail extends beyond its liquid products to its property and buildings. 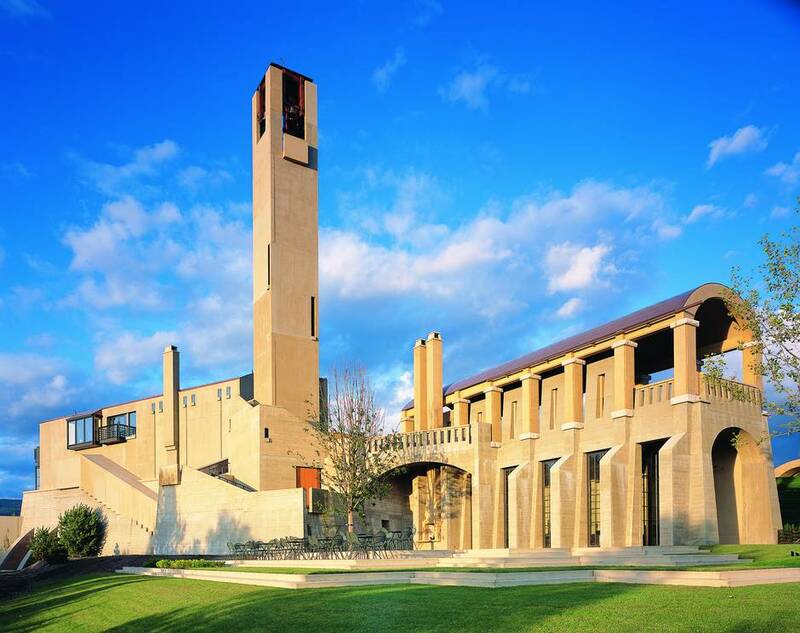 Mission Hill has 11 key architectural aspects, designed by Seattle-based architect Tom Kundig, from the fortress-like gates on the drive in and the archway entrance to a 12-storey bell tower and a grassy amphitheatre that plays host to open-air concerts in the summer. “After winning for top Chardonnay in the world in the 1990s I realized that award-winning wines weren’t enough to put the Okanagan on the world map,” says Mission Hill founder Anthony von Mandl. “I really believed that if someone didn’t build an icon winery in the Okanagan, we simply wouldn’t be able to build the region. This architecture statement even extends underground, to its subterranean cellars. The capacity of Mission Hill’s cellar is about 800 barrels (each barrel itself costs $1,600), and the cellar is controlled for climate and humidity. The only natural light that enters is from an oculus (Latin for eye), which is also the name of the winery’s premier blend (at $125 per bottle). Mission Hill’s architecture plays almost as key a role in the enjoyment of the setting as the vino itself. The winery is not entirely unique, though, in this regard. Wineries across Canada are increasingly cognizant that their properties can be just as much of a draw for oenophiles and agri-tourists as their elixirs, so they’ve stepped up their landscaping, architecture and amenities to showcase more than just row upon row of grapes. 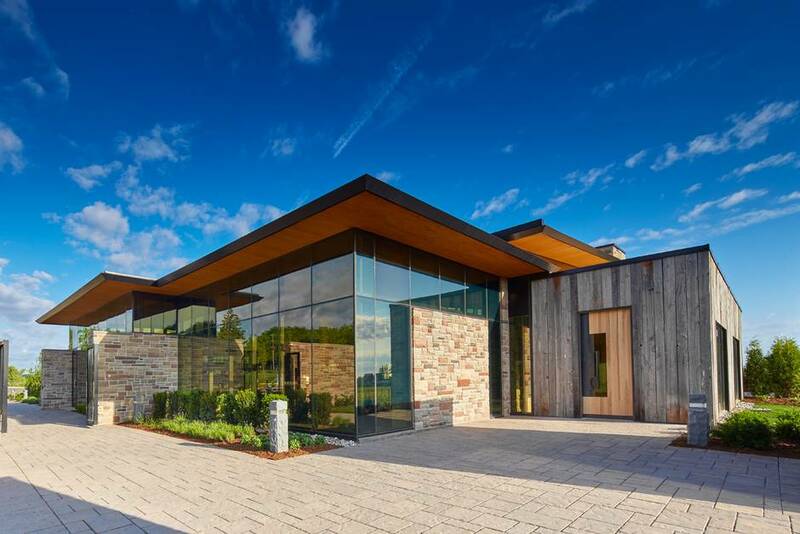 In Ontario, two wineries have been recognized by the Ontario Association of Architects (OAA) as finalists in its two previous Design Excellence Awards. Redstone Winery in Beamsville, Ont., combines traditional wine-producing techniques with state-of-the-art technology and creates organic wines. 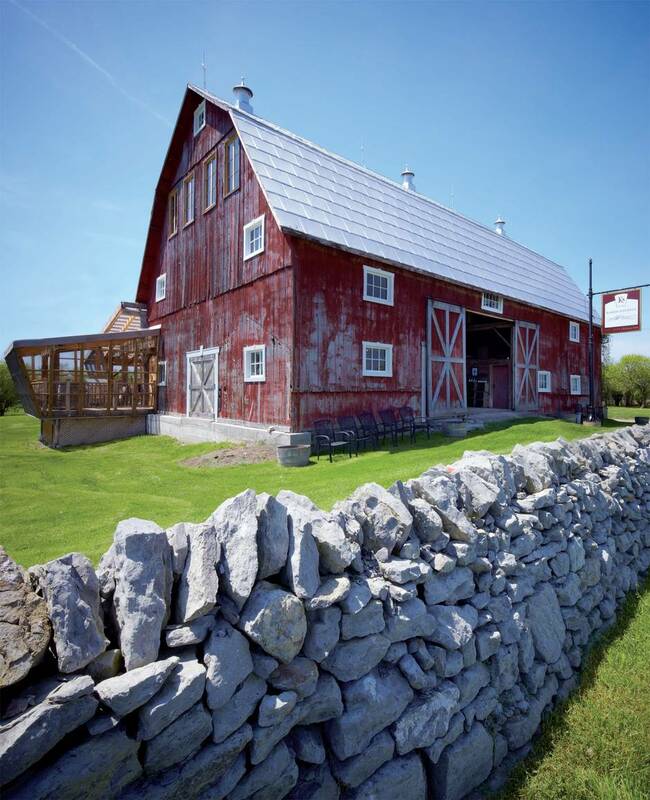 Reclaimed Ontario barn boards were used along with hickory and stone to construct its main building in the Niagara wine region. 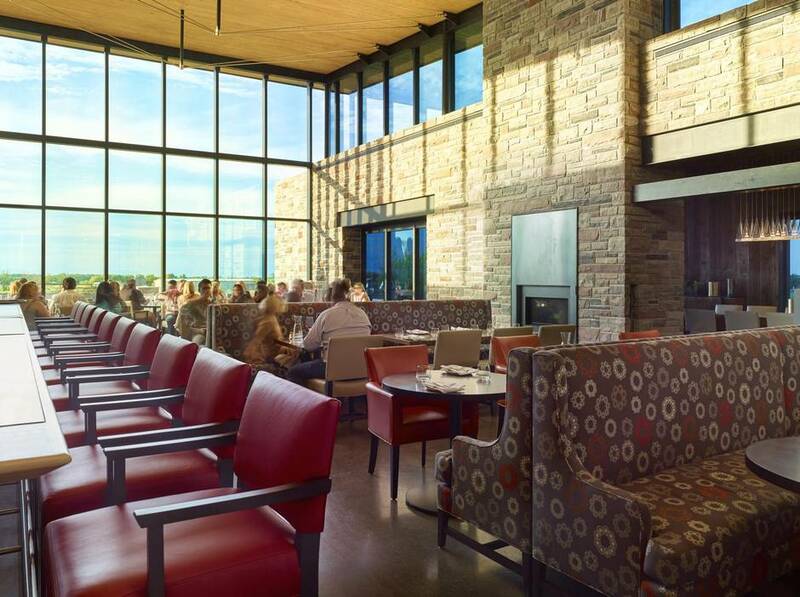 Redstone, designed by Sweeny & Co. Architects Inc., opened in 2014 – it was an OAA finalist a year later – and has been compared to a winery one would see in the Tuscan region of Italy. About 2 1/2 hours northwest of Redstone sits Dark Horse Estate Winery in Grand Bend, Ont. Designed by William J. Krohn Architect in association with Veld Architect, it opened in 2016 near the beaches of Lake Huron and received the same recognition from the OAA as Redstone that year. Its facility, which is more than 31,000 square feet, is designed with the owners’ love of horses in mind – rustic stone and reclaimed lumber are used to make the inside look comparable to a horse barn, albeit with a modern touch. Some of the wine production areas can be seen through all-glass walls and the building also features an event centre that seats 300 people. The winery wasn’t open until last year (it is yet to put out a vintage), but given that wow factor of the design, Mr. Rasenberg says Dark Horse is already planning to host 14 weddings in 2017 and one is booked for 2018. Maxim Voronov, a professor of strategic management at Brock University’s Goodman School of Business in St. Catharines, Ont., has done research on the Ontario wine industry and how wineries create a loyal following with their customers. He says audiences are motivated to visit wineries – or book weddings, as is the case at Dark Horse – in part because of various physical arrangements, including the architecture. At Karlo Estates in the Prince Edward County wine region, about three hours east of Toronto, that reflection is prominent. Unlike Mission Hill, Redstone or Dark Horse, which rely on statement buildings that mix classic materials with modern styling, the Karlo Estates home base is built in a two-century-old barn with a hip roof. “It was as if the family before us just closed the barn one night 50 years ago after work, and when we came along, we opened the doors 50 years later,” says Sherry Karlo, who co-founded the winery with her late husband, Richard. They purchased the barn in 2005 and Karlo Estates officially opened in 2010, becoming the world’s first certified vegan winery. “There was so much hay it was up to my rib cage,” Ms. Karlo says. “Sometimes barns become too modernized and they lose that charm. But we built [and renovated] this just on our own shoestring budget with our own money. So whether it’s a barn, a massively modern structure, or a blend of old-world and new with an iconic structure in the middle, Canadian wineries are counting on architecture more than ever to entice people to visit the vineyards.